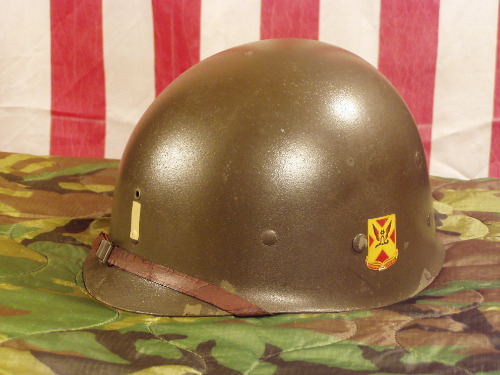 Westinghouse manufactured WW2 US Army 1st Lieutenant's M1 Helmet liner complete with green buckle chin strap, sweatband and fixed nape strap. The A-Washers are the green mid-war type. The Webbing is olive drab number three which was technically a greenish khaki, but in practice was produced in varying shades from khaki to greenish khaki. No cracks or holes are present on the shell. The original factory paint has been covered with a well done OD paint with a glossier finish. The paint has flaked in some areas around the edge. Both 84th Field Artillery insignia are decals. The "follow me" bar and the 1st Lieutenant's bar are both painted. The chin strap's leather is fairly pliable but has some surface cracks on the finish side. The Am Stay sweatband has good color and no cracks and has info stamp. The fixed nape strap is in good condition but no ink stamp is faded. The name "COX" is painted in two places on the interior of the shell. The 1st Battalion, 84th Field Artillery Regiment was first constituted on 16 September 1918 in the National Army as Battery A, 84th Field Artillery. The 84th Field Artillery Regiment as a whole was demobilized on 13 December 1918 at Camp Sheridan, Alabama. The unit was reconstituted on 17 March 1930 in the Regular Army as Battery A, 84th Field Artillery, an element of the 3rd Cavalry Division. It was activated on 1 July 1936 at Fort Riley, Kansas. The Battery was inactivated on 30 September 1939 at Fort Riley, Kansas, and relieved from assignment to the 3rd Cavalry Division. The unit was redesignated on 1 October 1940 as Battery A, 84th Field Artillery Battalion, and activated at Fort Bragg, North Carolina, as an element of the 9th Division (later redesignated as the 9th Infantry Division). With the 9th Infantry Division, the Battery participated in 8 campaigns during the Second World War: Algeria-French Morocco (streamer with arrowhead indicating participation in the initial assault), Tunisia, Sicily, Normandy, Northern France, Rhineland, Ardennes-Alsace, and Central Europe. After the end of the Second World War and time spent as part of Allied occupation forces in Europe, the Battery was inactivated on 20 November 1946 in Germany.